When credit card payments are received from a customer, they are deposited into your checking or savings account. You can change the bank account where these payments are deposited easily in the Online Service Center. Sign in to the Online Service Center. From the menu on any page, choose Account > Account Profile. 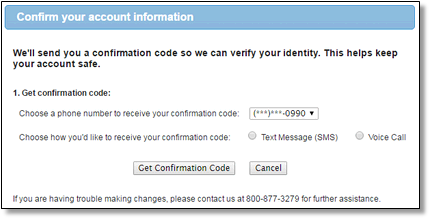 Select the Phone Number to recieve your confirmation code and the way you would like to receive it. Click Get Confirmation Code then enter the code you recieve and process to the next step. Enter the routing and account number. For checking accounts, you can get this from the bottom of the check. For savings accounts, you may need to get the routing number from your bank. Click the Reason for this account change drop-down menu; Be sure to ONLY choose None of the above”. If this is not selected, all changes including the DDA will NOT successfully take effect. Note: If the error: Routing Number Invalid occurs, you will need to verify the routing number with your bank or use the following website, http://www.routingnumbers.org to verify the routing number. What type of bank account can I use for deposits? You can send deposits to any standard business or personal checking or savings account based in the United States (foreign, out-of-country based bank accounts can not be used). The account must be transactional, meaning that Intuit can deposit and withdraw money from it. (For more, scroll down to this article's What are invalid account types? section.) Intuit deposits your payments to this bank account and also extracts payment fees from the same account. 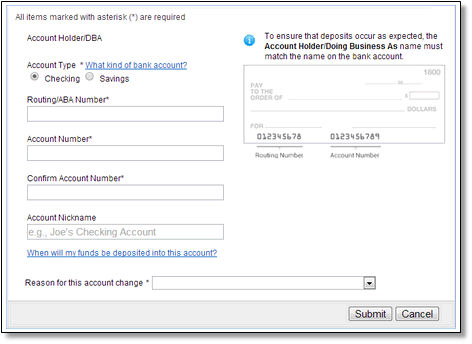 This bank account setting does not affect bank accounts in QuickBooks, it just sets a destination bank account for funds you accept through your payments account. You can enter and save multiple bank accounts, but activate only one at a time. In other words, you can't send deposits to 2 different bank accounts simultaneously, but you may switch between deposit accounts at different times. Using an invalid account type may result in a returned transaction, delay of payment and/or a suspension of payment funding. When do funds start going into the new account? When you add a NEW deposit bank account and have funds waiting, you usually get paid within 2-3 days.